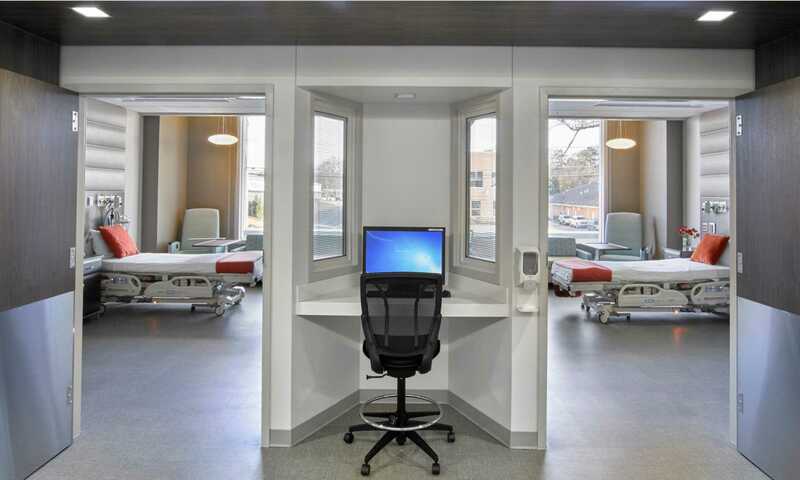 At a ceremony in Chicago, the International Interior Design Association recognized Erlanger East Hospital Surgical Center and Patient Tower with a 2017 Healthcare Interior Design Award in the “hospitals-community” category. Two leaders of the HKS design team, interior designers Grace Paul and Ana Pinto-Alexander, take us behind the scenes for an in-depth look at the ideas that underpin their award-winning design. Located in the Great Appalachian Valley, Chattanooga’s geologic formations offered inspiration for many of Erlanger’s most visible features. The tonal differences of the hospital’s exterior can be seen in the geology of nearby Lookout Mountain and Rock City, both popular tourist attractions. Distinct horizontal stratifications in rock walls, each representing thousands of years passing, are mimicked across the skin of the building. 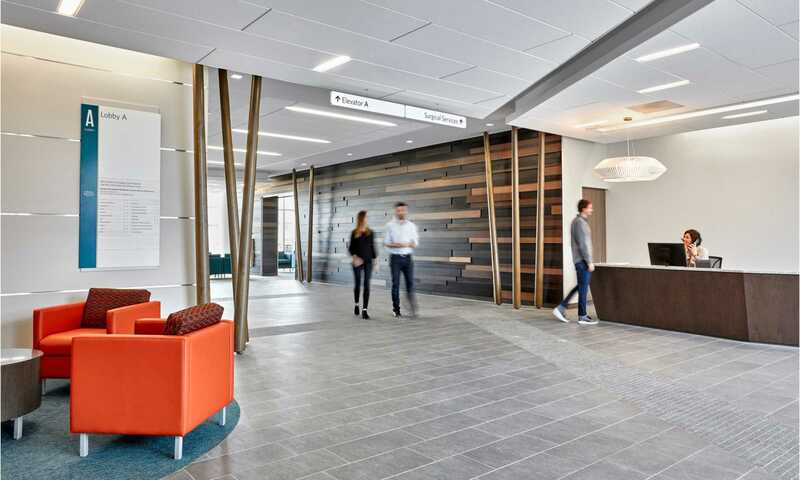 A unique, wood-covered wall signals key moments within the building, acting as a wayfinding element to highlight the elevators, waiting area and reception. Different tones within the layered, stained wood add warmth to the space and evoke diverse fauna that blankets the surrounding Appalachian Mountains. To showcase the spirit of Chattanooga through regional imagery, HKS worked with our client to orchestrate a competition for local photographers. We received more than 500 submissions, and around 100 pieces are featured in the space. In fact, every piece of art in the building is linked to that competition and the surrounding area. 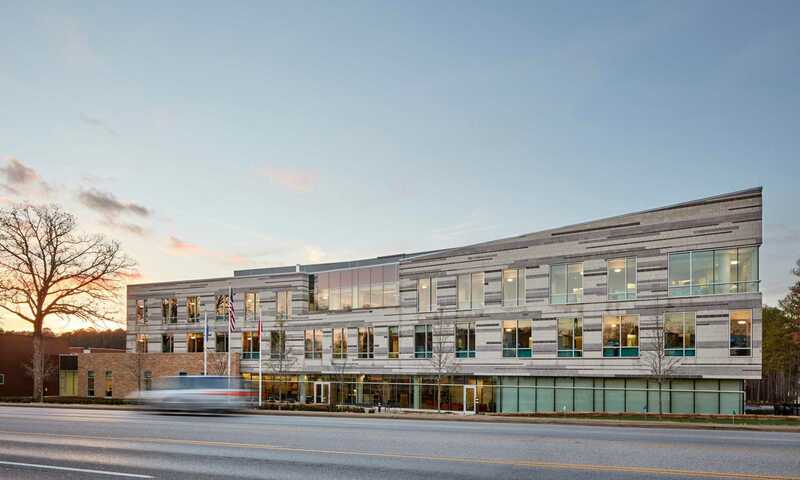 The client’s vision for the project was rooted in a campus available to all that would promote community health and well-being. The idea was to encourage residents to enjoy the campus when they’re healthy, not just when they’re sick. To that end, the project includes community space available for meetings and lessons on healthy lifestyle choices. 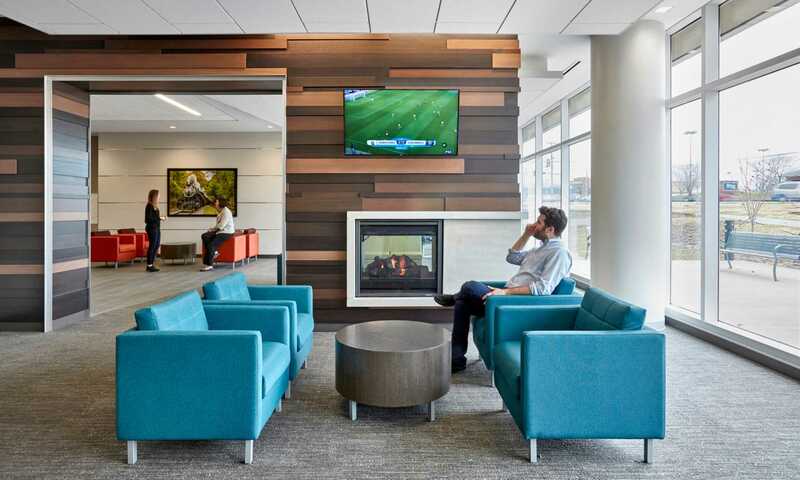 In the lobby, a central fireplace builds upon the idea of the space as a hearth for the community. Our goal for this space was to make it feel as non-clinical as possible. We wanted people to be comfortable coming to Erlanger East for their wellness needs as much as their illness needs. Tufted head walls, reminiscent of tufted headboards you find in some hotel rooms, are included in the patient rooms. 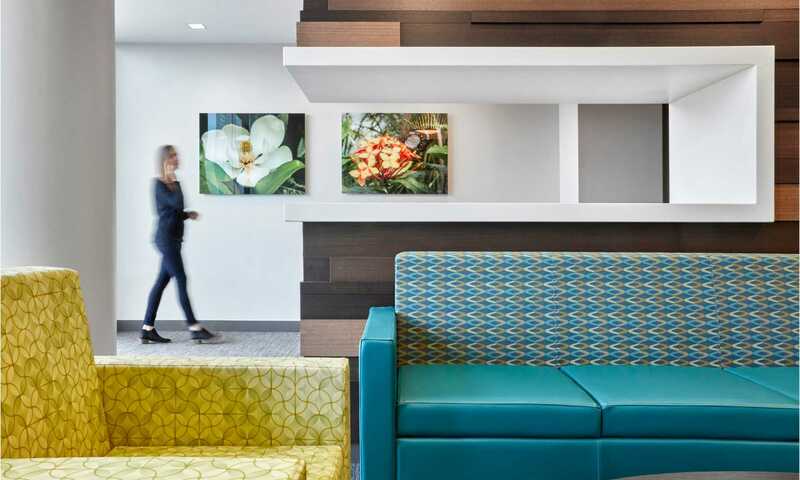 Lounges on each of the patient floors are designed more like hotel lobbies than traditional hospital waiting rooms. You might not notice it at first glance, but there is a putting green in the foreground of this image. We designed many landscape features to draw people in, such as a playground, a walking trail and a basketball court. 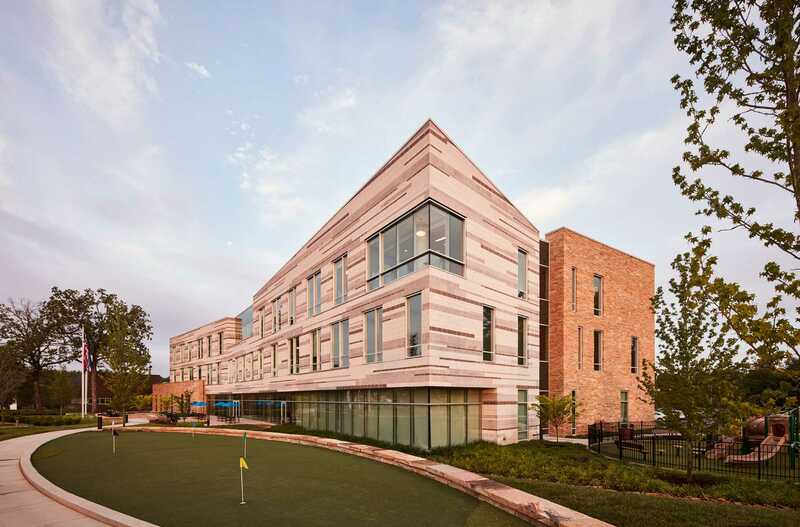 This is all part of the overall design objective to position this campus as a community amenity. We want people to come here to enjoy and promote their wellness, so we knew we had to make it fun. With 33 years of experience, Ana's extensive research in healthcare design anchors her belief that holistic-designed environments promote healing and maximize operational efficiency. Although healthcare design is Ana’s passion, she also creates interior designs for educational and life sciences facilities.